Made his debut with Maccabi Tbilisi (Georgia) during the 2005-06 season. Moved to Greece on November'08, signed by Panathinaikos Athens. In October'11 moved to Italy, signed by Pallacanestro Cantu for the 2011-12 season. In December'12 moved to Greece, signed by Olympiacos Piraeus. Moved to Spain for the 2013-14 seaosn, signed by CAI Zaragoza. In February'14 back to Greece, signed by Olympiacos Piraeus. In November'14 moved to Italy, signed by Pallacanestro Cantu. Moved to Spain for the 2015-16 season, signed by MoraBanc Andorra La Vella. Signed for the 2017-18 season by Malaga CB. Won the 2013 Euroleague with Olympiacos Piraues. 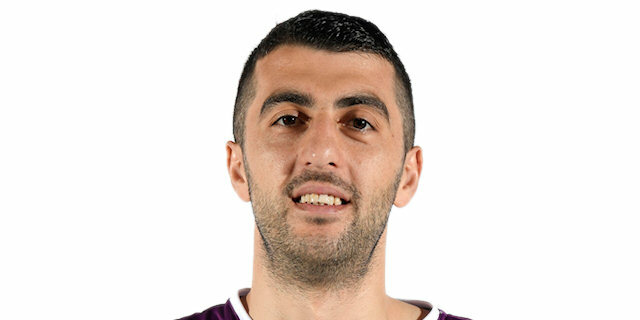 Named 2018-19 EuroCup Round 3 MVP. Has been member of the Georgian U-16 and U-20 National Team. Led the 2008 European U-20 Championship in blocked shots (3.7 bpg.). Led the 2007-08 Georgian League in scoring (33.5 ppg. ), rebounding (18.4 rpg.) and blocked shots (3.3 bpg. ).